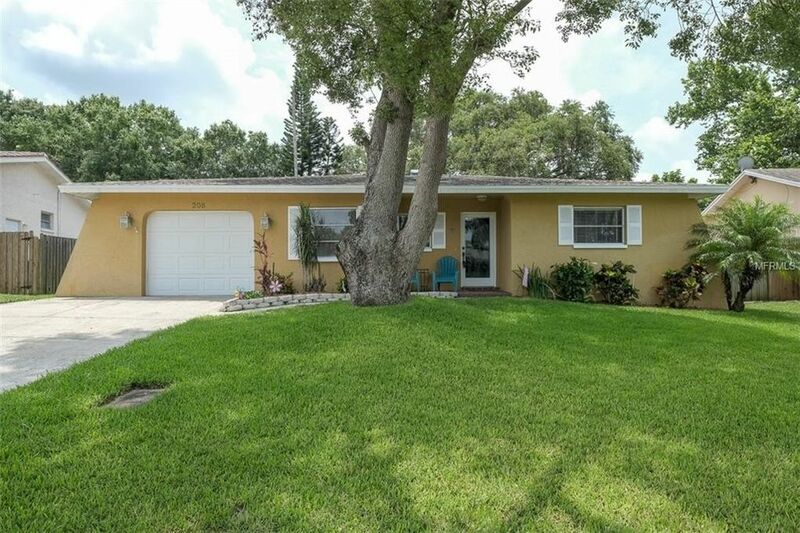 BEAUTIFULLY MAINTAINED & UPDATED PALM HARBOR HOME IN CURLEW GROVES. BRAND NEW ROOF INSTALLED IN MAY 2018 W/ A TRANSFERABLE WARRANTY. THIS 4/2/1 SPLIT FLOORPLAN IS A LOVELY GEM W/ A LARGE FENCED BACKYARD & NO REAR NEIGHBORS. RECENTLY UPDATED KITCHEN FEATURES STAINLESS STEEL APPLIANCES, ELEGANT GRANITE COUNTERTOPS & A STAINLESS STEEL UNDERMOUNT SINK 2017, KITCHEN CABINETS ARE REAL WOOD W/ NEWER HARDWARE. THERE IS AN AMPLE BREAKFAST AREA SPACE IN THE KITCHEN WHICH OVERLOOKS THE WELL MANICURED & LANDSCAPED FRONT YARD. THE LIVING ROOM/DINING COMBO IS SPACIOUS, OPEN & FEATURES RICH BAMBOO FLOORING & MODERN DESIGNED CERAMIC TILE. THE BACK OF THE LIVING ROOM FEATURES SLIDING GLASS DOORS THAT LEAD TO A SCREENED LANAI OVERLOOKING THE PRIVATE BACKYARD. MASTER BEDROOM FEATURES FRENCH DOORS, BAMBOO FLOORING, & 2 WINDOWS FOR NATURAL LIGHTING. THE MASTER BATHROOM HAS A TILED WALK-IN SHOWER & CERAMIC TILE FLOORING. THE OTHER 3 BEDROOMS ARE SURPRISINGLY SIZABLE W/ CARPET FLOORING, BARN DOOR STYLED CLOSET DOORS, BLINDS & CEILING FANS. THE 2ND BATHROOM WAS COMPLETELY UPDATED IN 2014 & FEATURES DUAL VESSEL SINKS, REAL WOOD VANITY CABINET, QUARTZ COUNTERS, NEW SHOWER/TUB COMBO, CERAMIC FLOORING & A LARGE LINEN CLOSET. OTHER SPECTACULAR FEATURES: TEXTURED CEILINGS, NEWER PLUMBING FIXTURES, ROOF 2018, NEW WATER HEATER 2018, CERAMIC TILE FLOORING 2014 & FENCE 2016. AND THERE IS A SHED IN THE BACKYARD FOR STORAGE. THIS HOME'S WONDERFUL LOCATION IS CONVENIENT TO SHOPPING, DINING, SCHOOLS, PARKS, GOLFING & BEACHES. Directions: GO WEST ON CURLEW RD TO NORTH ON BARBARA ST THEN GO WEST ON TALLEY DR TO THE HOME.